…. just a taster …. Thank you so much for all your hard work on my piano – it was really a labour of love. It’s a dream to play and I know you struggled with its failings but you’ve made it smile again. A skilled technician with a musical ear – what a winning combination. Thank you. 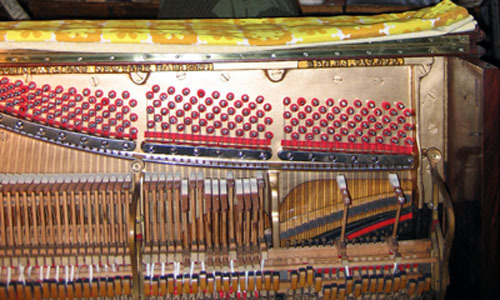 I just wanted to thank you for all the work you did on my Steck grand piano over two days. I’ve been playing it quite a lot since you finished the regulation last week. I’ve been greatly enjoying the improved quality of the tone and the action, as well as the evenness of the keys, which helps greatly with dynamics, as well as scales and runs. The upper register sings much more now and the bass has lost that muddiness. That makes it so much easier to hear the counterpoint when playing classical music, and I think I’m finding it easier to perceive the individual notes within complex chords (especially when playing jazz). I should also say that it was a pleasure to have you around, and to gain a little glimpse into the secrets of your craft. I’ll certainly call you again if my tuner recommends that any more work needs to be done. Vielen, vielen Dank für deinen Besuch, Ben, für dein handwerkliches Können und deine feinen Ohren! Nach dem Stimmen und Entonieren “singen” jetzt alle Töne, und obwohl ich häufig auf verschiedenen Instrumenten spiele – ich finde, kein Flügel klingt so schön wie meiner! I will never forget the first time you worked on my piano who had become a stranger after the hammers had been replaced.We had a long conversation and you understood exactly what I wanted…and you brought back my dear companion and made him sing beautifully again. Thank you so much for your kindness and for your advices.I trust your ears and competence so much that noone else has ever touched my piano in the last ten years..